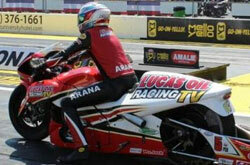 Race 1 of the 2016 NHRA Mello Yello Drag Racing Series season didn't go as planned for Lucas Oil Racing TV rider Hector Arana Jr., but he knows a first-round loss at the NHRA Gatornationals on Sunday at Gainesville Raceway is far from the end of his Pro Stock Motorcycle season. The NHRA season is only three races old, but drag racing fans may have already witnessed the biggest upset of the year as No. 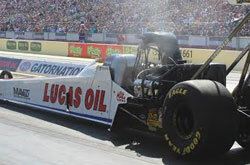 1 qualifier Richie Crampton, of Australia, lost to 84-year-old part-time pro Chris "the Golden Greek" Karamesines when his Lucas Oil dragster smoked the tires at the hit of the throttle. After qualifying No. 12 in the 16-car field of the 47th annual NHRA Gatornationals, Top Fuel pilot Morgan Lucas knew he needed to step up his performance in Sunday's opening round of eliminations to give his Lucas Oil TV race team any chance of advancing, and the reigning U.S. Nationals champion did just that, running an event-best 3.770 at 316.75 mph down Gainesville Raceway. 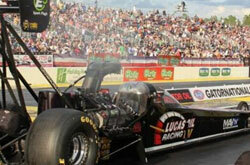 Hector Arana Jr. had his prayers answered in the final qualifying session for the NHRA Gatornationals on Saturday at Gainesville Raceway. 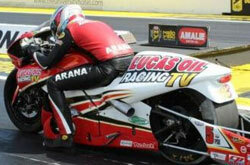 With a run he called the "Hail Mary of Hail Marys," Arana put his Lucas Oil Racing TV Buell in the No. 14 qualifying spot. After seeing Morgan Lucas Racing teammate Richie Crampton blaze to the No. 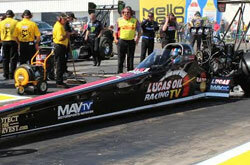 1 qualifying spot for the NHRA Gatornationals on Saturday at Gainesville Raceway, Morgan Lucas knows there is more speed in his Lucas Oil Racing TV dragster.